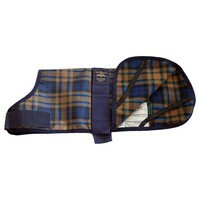 Animate Camel Watch Tartan Fur Lined Waterproof Dog Coat is an extremely warm and protective coat to keep your dog all cosy and nice on the cold wet days. Made from durable materials and with a special fur lined interior for extra comfort, this waterproof dog coat ensures your dog remains warm and dry when on wet walks. A stylish design on the exterior just adds a special touch to make your dog look as good as they feel! Measurements are taken from the base of the neck to the base of the tail.